William and Kate › Who will receive one of the 5000 invites to the wedding? Who will receive one of the 5000 invites to the wedding? Since Prince William and Kate Middleton announced they were getting married this spring, a host of celebs have been begging for an invite to the wedding. P Diddy, JLS and Nicole Scherzinger have expressed their desire to attend the celebration. Peter Andre and Serbian Crown Prince Alexander II even claim they already are on the list. The Sun reports that the guest list will be 5.000 Names long, and will include 2.000 close friends and 3.000 politicians, public figures and foreign dignitaries, who are selected by the Lord Chamberlain’s Office. The Royal Couple is reported to limit invites to family, friends and people playing a direct part in their public and private lives, so stars like Sir Paul McCartney and Dame Helen Mirren will most probably not be on the list. Celebrities who really are invited should avoid bragging because it is rumored that William and Kate plan to disinvite guests when they issue the invites for their big day. Clarence House said the royals wont provide a running commentary on who would be invited to one of the year’s biggest social occasions. It was however confirmed that Buckingham Palace is in communication informally with the wider royal family, and “notifications” have been sent out to keep the date free. But it was added that these notifications are not formal invites. This was written by admin. Posted on Thursday, February 3, 2011, at 4:01 am. Filed under Wedding. 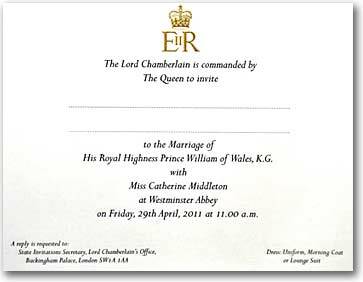 Tagged Clarence House, Guest List, Invitation, Lord Chamberlain. Bookmark the permalink. Follow comments here with the RSS feed. Both comments and trackbacks are currently closed. Hope I’m on their list for an invite.